I'm looking to Spend 15-20k on a defender 110 SUV. Whilst searching at this price I'm coming across newer 2.5 Td5's and older 2.4 Tdi's. Any advice or opinions on which to go for would be appreciated. TD5 are more well-known but surprisingly thirsty, the 2.4 is a Ford Transit TDCi lump so should be more modern and pretty robust, plus they're in millions of things. I believe they drive differently (info from a friend). The tdci has spud shaft issues between gear and transfer box. The td5 has oil in the loom issues (though I think this was earlier ones). The dashboards are very different tdci has a good heater and better clocks etc but no flaps and leg room issues. Td5 has the age old dash though upgraded, acceptable heater but does have flaps, better leg room but old style clocks etc. Personally having driven many examples of both my preference is for the Td5, I don’t like the later dash of the Tdci (though the heater is good!) and the gearchange is horrible. The higher gearing of the Tdci does make them faster and more comfortable on longer journeys though and there’s no doubt that the Tdci lumps are powerful and torquey. I’d still choose a good Td5 over a Tdci. Your budget is quite healthy so you may be able to get an earlier vehicle which has had a galvanised chassis/bulkhead swap, this would preempt the two biggest problems that occur as the vehicles age. As always with Defenders though they’re all much of a muchness, and a good one of any given variety will be better than a poor one of any other. General condition and evidence of good servicing/maintenance is far more important than age or mileage. I've got a 90TD5, but have driven a friend's 2.4 Puma-engined 110 quite a bit. I find the 6-speed Puma-engined option to be strangely-geared: First is stupidly-low so I generally use a few more revs and pull-off in 2nd. Then 6th is crazily-high and only really usable on free-flowing motorways - even then I find myself instinctively changing-down a couple of gears on gentle inclines or if I see bunching traffic ahead, so I know I'll have powerrevs on-tap for immediate response to keep up with the traffic. Pumas always feel rough to me: they're missing a cylinder and the dual-mass-flywheel the TD5 has to make things smooth. They also don't rev as freely as a TD5 (I'm happy to take my TD5 up to 65MPH in 3rd when going down motorway sliproads or overtaking on A-roads). The TD5 is a sportscar in comparison to the Transit lumps, but I was always taught to keep an engine turning fast rather than 'labouring' it in high gears. I can only say - try driving both and see what feels the most suitable to your driving-style. I have both, a very late 56plate 90csw and 2.4 tdci 90 hardtop. The tdci is far superior. They are both factory standard and unmodified and both 100k on them. Bad points of the tdci are the input splines which I have replaced with the Ashcroft kit, rear drive members but the td5 suffers the same, and when the clutch slave cylinder failed I had to remove the gearbox to replace it. Tdcis have dual mass flywheels and are costly to fix when (not if) they go wrong. The TD5 conventional clutch and flywheel are more reliable. The Tdci is a pain on gears - the 6-speed box is too low in 1st, a bit high in 2nd for most jobs, but top gear still seems too low just like 5th on the TD5. However, you can't fit an overdrive to the Tdci, while you can the TD5. The TD5 heater is typically weak, but usually down to a bad thermostat. Get that working correctly and ensure the heater matrix is clear on water and air sides and it's good enough. The Tdci heater is ridiculously over-powerful for most climates and on the lowest temp setting above fully-cold, it's still too hot even in cold winters, so you have to keep turning it off entirely. But for UK users, possibly the biggest problem with the 2.4 (but not 2.2) Tdci is road tax - they're all rated as commercial, and so are double the normal rate. I believe that it was a bit of a lottery on TD5s, not as simple as having station wagons all as private cars, but that many are private and so much cheaper to tax. The TD5 also has a dual mass flywheel and if that needs changing with the clutch it will cost £1,000. Personally having driven both l prefer the TD5, but some TDCi ‘s seem to drive better than others, l drove one that was really nice. You can buy a gear lever kit (called Shift-R) which is supposed to make the TDCi gear change a lot better. ln the end though l would buy on condition rather than type, if you see a really good TD5, buy it....you won’t be disappointed. If you find a nice TDCi then you won’t be disappointed with that either. Be aware that late TD5 and most 2.4 TDCi Station Wagons are subject to the highest rate road tax. Everything modern & diesel has a DMF, you're not going to get away from that, they're a wear item like the clutch. My biggest problem with the TDCi is their parts are sought after so they are #1 target for thieves, friend of mine had his stripped in his driveway overnight - doors, bonnet, seats all gone. Yes that’s happened round here. You can take steps to make it harder for the thieves, but the best thing is to make sure you have Agreed Value insurance. Then if it does go, at least you will get the proper value. 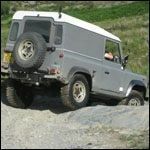 The “book” prices for Defenders are well below what you actually have to pay, and that’s in the Land Rover magazines! Not quite! Although the silly prices being asked by chancers on some auction websites can be ignored. Tdcis have dual mass flywheels and are costly to fix when (not if) they go wrong. The TDCI engine uses a conventional clutch and flywheel (for good and bad) and clutches are a known weak spot (springs go soft, fail and fall out apparently). I find the 6 speed box perfectly acceptable in both gearing and action. 1st is low but 6th will pull strongly from 45, which I find OK. The rest are spread nicely. Tax is high for some model years (mine is £555 at the mo) but there are late 2.4s at the lower rate - you can check before you buy. Added benefits on the TDCIs are decent A/C and a very efficient heater, galvanised steel doors (pre-plated I think) and decent seats with 5 x 3 point seat belts. I had the same choice of TDCI and TD5 when I bought mine but wanted the more modern engine, and even if it sounds a bit "Transity" it has plenty of poke. There are some things to bear in mind when buying a Defender. Some will have been privately owned and used relatively gently but may have had some items skimped on because of cost. Some will have been commercially owned, used hard and serviced as per the book until they meet their whole life cost, at which point they will be disposed of. .
Tdci has the solid flywheel as above, with Td5s being the ones with DMFs. The former doesn’t suffer with DMF failure as above but the clutch is carp, though at least that’s cheap to swap. And it’s the commercial Tdcis which have the cheaper tax rate. A certain number of Station Wagon variants during the 2.4 Tdci period were classified as M1 passenger cars rather than N1 commercial, and so are taxed at a high rate based upon emissions. All the other (commercial) variants in this period are taxed at the standard rate, as are all variants in other years of production. The difference is a few hundred quid a year and, unless you’re barely using it, amounts to a miniscule proportion of the total cost of running the vehicle. I wouldn’t let it put me off buying the right one. Well that's cleared things up! It was getting very confusing. No. I had a 2009 TDCI 90 with 500pa tax, so thanks for disputing my personal experience so definitively. The 2.2 were cheaper, and maybe late 2.4s. I was under the impression that TD5 Discoverys had dual mass flywheel, but that Defenders had conventional clutches, bit stand to be corrected. Certainly not a system reputed for reliability, whichever vehicle had it, though. Was it a commercial variant classified N1 or a non-commercial (SW) variant classified M1? It's a "commercial" as far as UK VED is concerned. "TC39" light-goods-vehicle. "Registered on or after 1 March 2001 and not over 3,500kg revenue weight" so £250/year. 90 Station Wagon XS. I can't remember the V5 details, but it cost twice the annual charge of my Tdi RRC at the same time. So yes, as it was classed as non-commercial it attracted the higher tax rate. A hard-top of the same year would have just had the standard rate (c. £250) as per above. It was your assertion that the commercial variants attracted the higher tax that I was disputing, as it is in fact the other way around.